A new chapter began in one professional volleyball athlete’s life when he retired from his athletic career to return to California State University, Northridge to get a master’s degree in computer science with an emphasis in computer security. Eric Vance’s team photo from the time he played for CSUN. Photo courtesy of Matador Athletics. Eric Vance, who earned a bachelor’s degree in economics from CSUN in 2009, came back to the university in 2014 with the intention of getting a second bachelor’s degree in computer science, but last year he decided to go the extra mile and earn his master’s degree in the same subject instead. 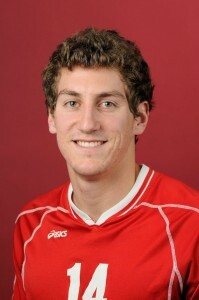 When Vance first came to CSUN in 2004, he was a freshman and a new recruit to the university’s Men’s Volleyball team. Like many students, he was unsure of what he wanted to study. By his second semester, Vance found his major in an introductory microeconomics course. After graduating in 2009, Vance launched his professional sports career, playing volleyball in Puerto Rico before playing for the U.S. at the Pan American Games in Guadalajara, Mexico, in 2011. “The Pan American Games in Guadalajara, and receiving a USA jersey with my name on the back, was the highlight of my career,” said Vance. Before playing for Team USA, Vance played in Doha, Qatar in the 2010 Fédération Internationale de Volleyball, Volleyball Men’s Club World Championship, then in the south and northeast of France for three years and finished his professional volleyball career in Greece. Though Vance was playing around the world, he still had a yearning to learn more about computers. When he retired, Vance returned to CSUN to study computer science. 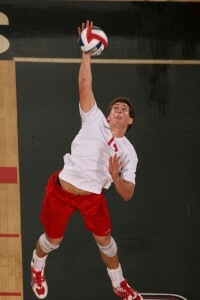 Eric Vance while playing volleyball for CSUN. Photo courtesy of Matador Athletics. Vance once considered becoming a firefighter, and even earned an associate’s degree in fire science from Oxnard College in 2010, but he knew his real passion was somewhere in the world of computers. “I’ve always loved computers and always loved technology, and that’s why I came back,” he said. Traveling around the world for his athletic career didn’t leave much time for Vance to socialize with his friends back home. During his spare time, he sometimes played video games online with his friends. He soon realized that he did not want to just play the virtual games, he wanted to learn how to create the magic for the game players behind the scenes. Today, Vance is two electives and a thesis paper away from receiving his master’s degree. During the course of his studies, Vance discovered a passion for computer security ​— an algorithm-based system that protects people’s computers from being attacked by theft or damage to their hardware, software or information. In 2015, during his second semester of graduate coursework, Vance was introduced to the world of computer security when he joined the CSUN student club Layer 8. The club educates students about computer security and tests their skills at national computer security competitions, such as Collegiate Cyber Defense Competition, National Cyber League, and United States Cyber Challenge capture the flag competition. He soon became the vice president of the club for the spring and fall of that same year. Vance is currently interested in studying software and programming by finding ways to make it safe from attacks. In the future, he also would like to study malware analysis. CSUN computer science graduate coordinator and professor Ani Nahapetian currently is working with Vance on a research paper for publication on mobile security. Vance’s mobile security project examines ways to make smart devices like phones and watches more secure by leveraging the connectivity.